Michael came home with a huge block of feta cheese and I was inspired to make two great salad sides, one to have with grilled burgers and another to have with a roasted chicken. The quinoa was perfect with a good burger just off the grill and would be a substantial bowl full for someone that has chosen not to eat “meat”, certainly not everyone’s chosen side for burger night, but it worked for me. 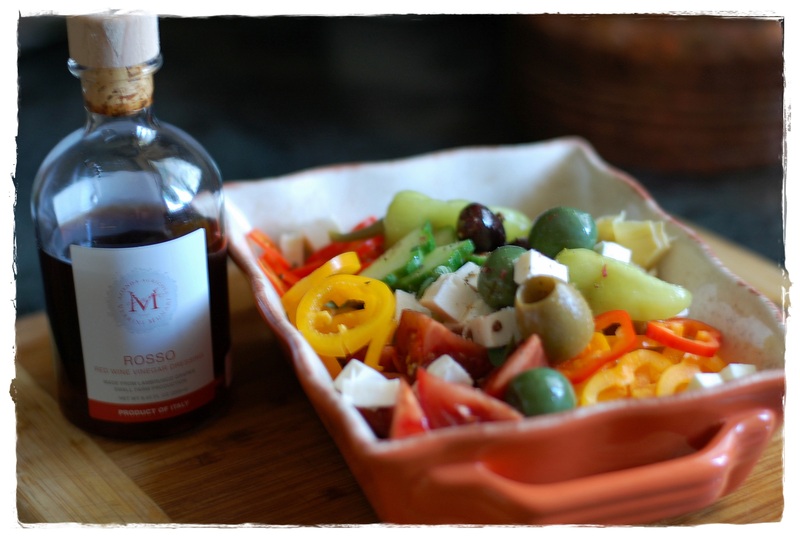 The Greek salad was made using the ever delicious Kumato tomatoes, sliced baby peppers, assorted pitted olives, cucumbers, a few whole slit pepperoncini peppers and dressed with drizzles of vinegar, EVOO, and chopped fresh oregano. Toss together, taste, adjust and season with salt and pepper, toss in feta cheese and serve. Changes that I made…I used 1 cup Nature’s Earthly quinoa choice that requires a 30 minute soak after rinsing, drain completely and 1 ¾ ounces canned broth. 1, Place the quinoa in a fine mesh strainer and rinse thoroughly with cool water for at least 2 minutes; drain. 2, Heat the olive oil in a medium saucepan over medium-high heat. Add the drained quinoa and cook, stirring, for 1 minute to toast the grains and evaporate any remaining water. 3. Stir in the chicken broth and bring the mixture to a boil. Reduce the heat to the lowest setting, cover and cook for 15 minutes. 4. Remove the pan from the heat and let the mixture stand, covered, for 5 minutes. Fluff the quinoa with a fork and set aside. 5. Steam the asparagus for 2 minutes, or until tender-crisp. Transfer the asparagus to a colander and rinse under ice-cold water to stop the cooking process. Drain thoroughly and set aside. 6. 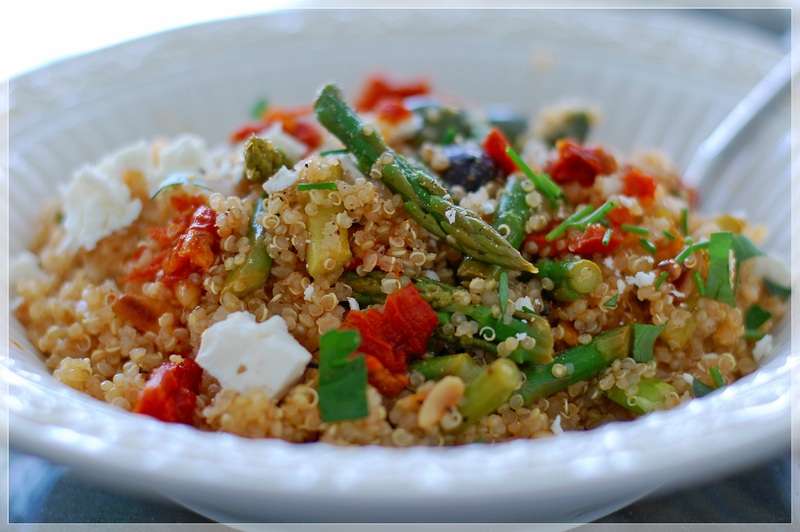 When cool, combine the quinoa, asparagus, sun-dried tomatoes, olives, onion and feta cheese in a large bowl. 7. Whisk together the garlic, oil from the sun-dried tomatoes, lemon juice, oregano and basil in a small bowl. Add sea salt and pepper. 8. Drizzle the dressing over the salad and toss gently to combine. Top with the additional crumbled feta cheese and toasted pine nuts and serve immediately. Prep and cook time: 45 minutes. Serves 8.